Recently, I completed a design proposal for a new house on a double lot just up from the water in Manhattan Beach. It launched a study to more deeply understand the fundamentals and nuances of local Spanish building precedents that have influenced southern California architecture for over 300 years. Many of the challenges were twenty-first century: The site is very tight, with significant setback, height and view corridor restrictions, and the client’s program is extensive. The design concept, as it evolved, sought to fracture the large scale of the house and make it compatible with the context, an established neighborhood with smaller houses built on single lots. The concept also married two conflicting architectural prototypes: the townhouse and the courtyard house. 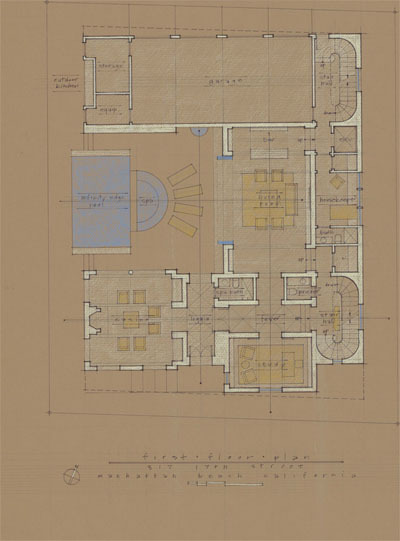 The townhouse is typically vertical and composed of only interior spaces; the courtyard house typically spreads out horizontally and has numerous connections to the primary exterior space. Here, we had three full floors plus subterranean programmatic spaces, and yet we wanted to create multiple options for exterior living spaces with a range of views, sun exposure, and character. On the ground floor, one of the spaces we created was a formal “living room” in which to enjoy the phenomenon of being simultaneously inside and out—a well-defined room with ceiling, walls, fireplace, and window-size openings, but with no glazing in the openings. The plan that developed is very formal, with circulation based on a Baroque sequence of axial spaces. The house becomes less formal toward the top, capped by a penthouse-like family living space with extraordinary views over the roofs of down-slope neighbors to the ocean. Additionally, the clients desired an architectural expression which made references to local Spanish traditions. The only way I know how to authentically use a historic vocabulary is to find conceptual principles and specific elements of that vocabulary that are relevant to contemporary life. As it turns out, the language of thick walls, monolithic volumes, deeply shaded interiors and private exterior living spaces is dramatically relevant. As an architectural assemblage, they constitute more than a “style”. They add up to a way of building that makes sense in this mild climate, and I was eager to understand it at a deeper level with a specific project. With this project has come the opportunity.